I love my beautiful Easter eggs that I have been crafting for years out of hand-blown eggs but now I have little grandchildren. Hand-blown eggs and little ones are not a good combination. Last week I went to Pennsylvania for four days to visit and help my son-in-law and daughter (now 7+ months pregnant) with adjusting a bedroom for one little boy to now work for an expected little sister as well. 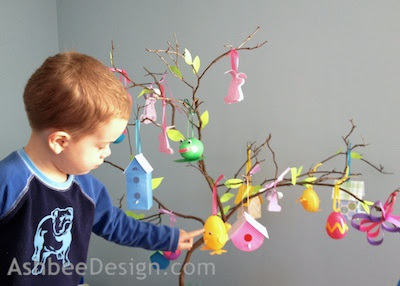 I came prepared to make an Easter egg tree with my grandson who is a couple of months shy of four. I did not use hand-blown eggs! I created a tree that I expect little hands will love, and one that will probably topple over more than once in the next week. I apologize for the iphone photos. Sometimes that is the best option. The tree is made from a dead Mountain Laurel branch I brought with me. We secured it in a recycled plastic Planters peanuts jar filled with sand. I wrapped that container in colored duct tape covering the top so the sand can't spill if this tree topples. I crafted paper grass to cover the duct tape. Onto the tree we added many of my paper bunnies, some of my new paper bird houses and plastic eggs that Taylor and I decorated together. That really means that I decorated as Taylor played "Santa Claus" with the other plastic eggs. He did have fun directing as we added things to the tree. His favorite egg is a little chicky made from a plastic egg and googly eyes. Most nearly 4 year olds love googly eyes! I used paper ornaments made on the Silhouette to add some variety. This bird house is a hint on a future project to be shared. 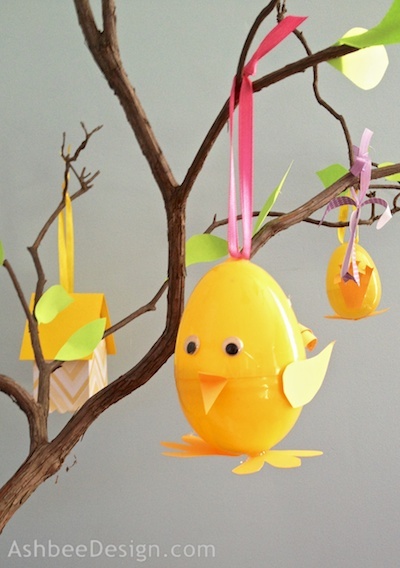 The eggs are all plastic eggs decorated with brightly colored duct tape shapes - quick and easy and non-breakable! I hot glued spring green leaves randomly on many of the branches. And, as could be expected I ran out of time. I just spent too much time building pillow forts! It was a wonderful 4 days and I know it brought good childhood memories to my daughter. We made lots of Easter Egg trees over the years. Making memories, so important! I love how the tree turned out. And the birdhouses are a nice touch! Hello Anjana, Thanks. I thought the tree had a lot more interest with different things on it. 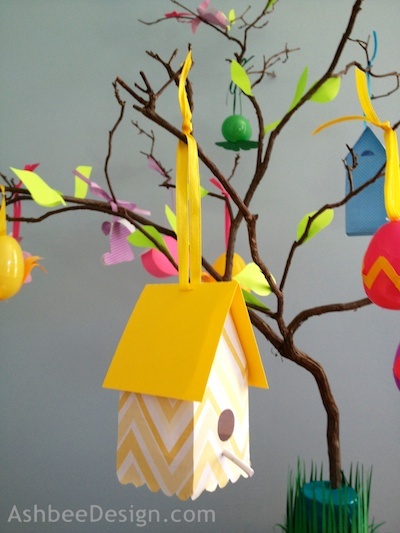 I added both bird houses and bunnies, all in paper so little hands can touch. Adorable so bright & fun! Thanks Jodie. Have a wonderful holiday with those you love as well. 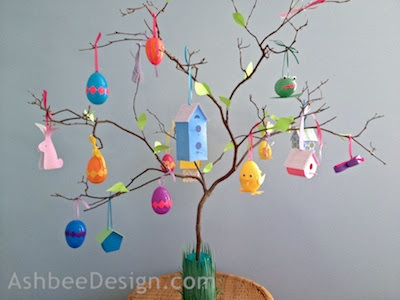 I'll bet your grandson loves the easter tree. What sweet memories he will have. Thank you for linking up to What We Accomplished Wednesdays. Have a lovely week! Hi, these are soo cute. Coming from Green Willow hop. I am pinning this. I would like to invite you to join Pin It Monday Hop Where you pin and get pinned (LINK). You can share up to 4 post. Followed you via Twitter and added you to Feedly. If you get a chance, I'd love for you to stop by and join us. I hope to see you there.